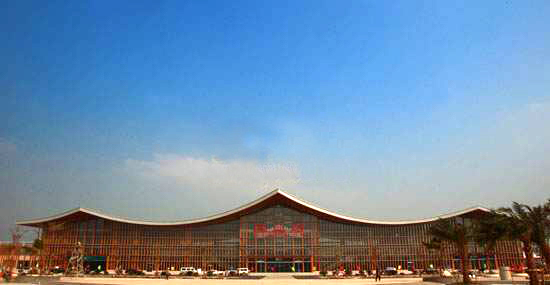 The new Sanya railway station on East Ring Railway will be soon put into use. It is the southernmost railway station in China as well as the largest station among the fifteen railway stations on the East Ring Railway in Hainan province. The station, which has a very clean, airport-like look and feel, covers an area of 16,000 square meters with 4 platforms and 8 driveways. There are a total of 1,420 bench seats in the waiting areas on the first and second floors which provide enough seats for the passengers. High-techs are fully used in the construction of the station, which means the whole ticket-selling system can be done by using the ticket vending machines and automated ticket examination machines. Besides, the advanced security equipment, remote control facilities and surveillance cameras make up the station security system. At present, the new railway station has been basically completed. It is currently under debugging stage and will be put into use at the end of this month, according to the station staff.